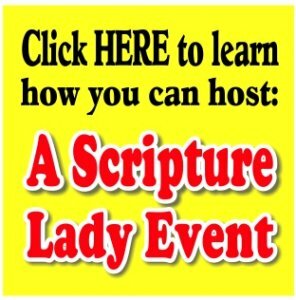 Invite the Scripture Lady to present her preschool Bible song program “The Armor of God” – a fun Scripture-filled musical presentation for young hearts. The belt of truth, the breastplate of righteousness, the shield of faith, the sword of the spirit, the shoes of peace and the helmet of salvation! This world is definitely not our forever home and we need every bit of God’s protection that He gives us. Thankfully, the Lord has blessed us with his powerful armor – the armor of God! “The Armor of God” is full of lively Bible verse songs, Bible skits and games all designed to introduce your little ones to the armor of God. Bible Verse Song #1: “The Battle is Not Yours“ (2 Chronicles 20:15) – Second Chronicles 20:15 says this: “Do not be afraid or discouraged for the battle is not your but God’s.” Whether we like it or not, preschoolers are already learning that life is not always fair. The Scripture Lady believes that it is never too late to introduce God as your children’s protector and to introduce them to His wonderful armor. There can be great comfort in knowing God fights our battles for us, even the little battles of the very young. Teaching Point #1: The Belt of Truth – The first piece of God’s armor is the belt of truth which should remind us to know God’s truth and to alway tell the truth. With each piece of armor, a child from the audience is given the chance to “dress” Scripture Lady’s friend, David, with the proper armor piece. The preschoolers have a great time watching David get suited up with God’s protection. Bible Verse Song #2: “Right and True” (Psalm 33:4) – Psalm 33:4 says this: “For the Word of the Lord is right and true. He is faithful in all He does.” What a perfect Bible verse to explain how true God is! Teaching Point #2: The Breastplate of Righteousness – A child gets to give David his breastplate of righteousness while the Scripture Lady reminds the children that the breastplate protects our hearts from wrong as we choose to do what’s right. Bible Game #1: “Hands Up, Hands Down” – Here is a fun little game which will present right and wrong situations to the children. If the situation is right, they will raise their hands up high over their heads. If the situation is wrong, they will drop their hands down to the ground. For example, Stacy sees her baby sister drop her bottle. Stacy picks the bottle up and gives it to her mom. Does Stacy get a hands up or a hands down? Bible Verse Song #3: “Imitate God” (Ephesians 5:1) – Ephesians 5:1 says this: “Imitate God therefore in everything you do for you are His dear child.” Here is fun Bible verse song with fun movements that will teach the children to love like God, forgive like God, share like God, be kind like God, and be faithful like God. Teaching Point #3: The Sword of the Spirit – This piece of God’s armor is often the audience’s favorite as Kathy pulls out her inflatable swords to remind the children of God’s wonderful Word, the Bible. Bible Verse Song #4: “Living and Active” (Psalm 40:1) – Taking the swords, the Scripture Lady teaches the children Psalm 40:1 with some very cool sword wielding moves! Bible Game #2: Bible Swords – This fun game uses large posters of 6 of the most beloved Bible stories such as Noah and the Ark, Adam and Eve and Jacob Dreaming of the Angels. Kathy presents her extra large Bible which contains little play swords with the names of these famous Bible characters. A child will have the chance to pull a sword out of the Bible and match it with the correct Bible story picture. Bible Object Lesson: “Jesus is Always with Us” – Using a “magic” bag, the Scripture Lady will engage the children with a fun object lesson which will teach them that even though Jesus does not live on earth anymore, He is still with us by faith. He left His Holy Spirit to be with us and comfort us all our lives. As we grow in God, our faith will grow too! A Scripture Lady Hymn: “Leaning on the Everlasting Arms” – By faith, we can lean on God for everything. We can begin to teach this truth even at a young age. “Leaning on the Everlasting Arms” is an old hymn put to today’s modern beat and will encourage your children to lean on Jesus. Teaching Point #5: The Shoes of Peace – Do you have your shoes of peace on? I hope so because life takes you a lot of places, and you and your children will want to follow Jesus wherever He leads. Bible Game #3: “Whose Shoes?” – Ballet shoes, tennis shoes, cowboy boots…There are so many kinds of shoes! Here is a fun Power Point game to help your little ones learn about the different kinds of shoes and how God wants whatever kind of shoes they are wearing to be filled with His peace. Teaching Point #6: The Helmet of Salvation – Here is the last piece of armor that David needs to be dressed in. The helmet of salvation protects our minds. Preschoolers can begin to learn that God wants them to think good and kind thoughts.